Oh la la! Your little girl will be oh so chic in this pretty outfit! 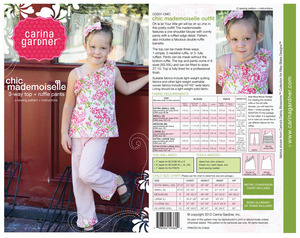 The mademoiselle features a one shoulder blouse with comfy pants with a ruffled edge detail. Pattern also includes a fabulous double-ruffle barrette. The top can be made three ways: 1-simple, 2-neckline ruffle, or 3- fully ruffled. Pants can be made without the bottom ruffle. The top and pants come in 6 sizes (XS-XXL) and can be fitted to sizes 2T-10. Top is fully-lined for a professional finish. Suitable fabrics include light-weight quilting fabrics and other light-weight washable woven fabrics including 44″/45″ wide fabric. Lining should be a light-weight solid fabric.